The hortIMPACT program combines Kenyan and Dutch private sector expertise and social impact solutions to build sustainable, inclusive domestic and export horticulture markets in Kenya. This article summarizes the insights and reflections from a visit to one of the hortIMPACT business cases, a farm in Gilgil, Kenya. The farmer grows a variety of green leafy vegetables and tomatoes, which he supplies to the shop Zucchini and other markets in Nairobi and nearby Nakuru. Innovative production solutions are used, such as vertical grow bags; a net house as an alternative to plastic greenhouses commonly used in Kenya; and a hand-held scanner for real time soil testing. A group of Food Security Advisors and Agricultural Counselors from 12 Dutch embassies across Africa, Asia and the Netherlands visited Kenya from June 12 to 15, 2017. This “learning journey” was meant to jointly learn and reflect on results, successes and failures from implementing the Food and Nutrition Security (FNS) policy in the context of the aid and trade agenda. They visited selected projects implemented with support from the Dutch government. This article summarises the findings from the second field visit. Reducing food losses and improving efficiency in supply chains. By employing a business case model, hortIMPACT concentrates their support on a number of promising business cases within agribusinesses and farmer groups. Those that have been selected are due to their economically viability, innovations and scalability. These business cases offer exciting opportunities to grow an inclusive horticulture market by addressing productivity, food safety and post-harvest losses. SNV also routinely shares lessons from these business cases with farmers, policymakers and domestic and Dutch agribusinesses for potential scaling up opportunities. In one example business case (number 7), their aim is to enhance food safety of green leafy vegetables through improved production technologies. This case is led by input supply companies with Dutch links i.e. Koppert, Soilcares and Kenya Highland Seeds, distributor of RijkZwaan seeds. Overall, business cases are led by Kenyan farmers and/or companies and SNV plays a facilitation role while providing market studies and bringing parties together. A similar setup in the first business case that hortIMPACT implemented realized high technology uptake with 75% of the farmers reporting adoption of one or more of the technologies and/or innovations. A 5-20% increase in sales was observed in participating companies. Furthermore, the private sector taking lead in promotion of good agricultural practices is building sustainable relationships with farmers as they are now actively seeking advice from the input suppliers and lead farmers. These relationships are expected to continue beyond the project life. Improvements in production practices for food safety are complemented by efforts at the market end to guarantee safety and reduce waste. Currently, there are discussions going on with market outlets such as supermarket chains (Carrefour) and open market distributors in Nairobi to establish food traceability systems for improved food safety. When working with large buyers, inclusive business is an important dimension as the program has learned that it is important to work with companies offering good deals for farmers. The participants visited one of the lead farmers for a hortIMPACT business case, Wilson Njuguna, a vegetable farmer supplying to high end vegetable shops, such as Zucchini. Njuguna welcomed the participants to his farm and shared that he was driven by his passion for agribusiness and bought a two acre piece of land from another farmer who was unable to properly utilize it. On the farm, he now grows a variety of green leafy vegetables and tomatoes which he supplies to the shop Zucchini and other markets in Nairobi and Nakuru. The vegetables are grown in UV treated net houses and in the open field. Partnerships with private companies were evident on this farm. Companies such as Real IPM, Soil Cares and Kenya Highland Seed were all at the site and each provided a solution for Njuguna. Collaboration with other companies to ensure complementarity, such as in pest and disease management, was seen as a key element of success in this business case. Firstly, Real IPM is providing solutions for safe vegetables and sustainable farming through grow bags that have a capacity of 100 vertical plants. The bags conserve water and space, and ensure no contamination by soil borne diseases. Real IPM has growing sale numbers of these bags in the urban areas like Nairobi where space is limited, and in coastal areas that experience water scarcity. The company also provides biological, often preventative, solutions to manage pests and diseases. Elements of drip irrigation are also incorporated into the bag design as a means to conserve water. Another partnership with Njuguna’s farm is with Royal Seed. They ran a demonstration of different varieties of hybrid seeds for tomato, cabbages, kales and pepper on the farm. These were done in a net house as an alternative to plastic greenhouses that are commonly used in Kenya. The metals and nets were supplied by Illuminum Greenhouses and Transglobal respectively. Four different varieties of tomatoes, including bush tomato bred by RijkZwaan, were grown in the netting which made it a perfect training site for farmers with different preferences. The farmers not only learned about good agronomical practices, but also about how to make informed decisions on whether to make an investment in a greenhouse, a net house, or do open field cultivation. Several visiting embassy staff members discussed the issue of affordability of the investments, particularly given the difficulties farmers often encounter in accessing financial services including insurance. Soil Cares as the third partnership presented an innovative hand-held scanner for real time soil testing for three primary nutrients (nitrogen, phosphorus and potassium), pH and organic matter. Based on the soil test results in combination with Soil Cares’ global dataset, the company provides advice to Njuguna and other farmers on the best options for fertilizer. Given the real time nature of this form of soil testing, farmers indicated that they trusted the results more as opposed to taking their samples to the laboratory for testing, which may take a long time. So far, Soil Cares has seen success stories from farmers using their testing service and impact data on yields are being collected. The scanners would normally be used by private agricultural service providers or farmers’ cooperatives to whom farmers would pay a service fee. Soil Cares is gradually developing its network of soil test service providers including spray service providers who will collaborate with Soil Cares in another business case of hortIMPACT and be trained on soil testing in future. EKN Ghana representative Josephine Ecklu related this business case to the work of Ghana Veg, a program that supports commercial vegetable sector development through the use of out growers. The objective is to promote consumption of vegetables at the household level, and for SMEs to sell to the high-end markets in Accra. Ecklu mentioned that innovation and safe use of sprays is key to ensuring that farmers reap the benefits of their businesses. The embassy is also supporting 30 projects across Ghana which are interlinked to other sectors such as cocoa production. 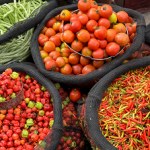 Consultancy firm Delphy has completed a cost benefit analysis of different models of greenhouses and financing models available in the context of Ghana Veg. The analysis explored which models are most appropriate and affordable to farmers. Food & Business Knowledge Platform (F&BKP) representative Nicole Metz also added that there is a need for all actors along the value chain to collaborate and strengthen contractual agreements with farmers. EKN Rwanda representative Ton Negenman acknowledged that while Kenya had made strides in adopting various innovations and technologies through public-private partnerships, Rwanda is in the infancy stage of horticulture sector development. Negenman said there are a number of lessons that Rwanda can learn from Kenya, for example, in developing the new “Hortinvest” program with several Dutch stakeholders. This program will include a co-financing fund and business skills for farmers, financing, and technical aspects that are all equally important for success. 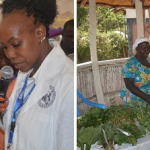 Ernesto Sechene of EKN Mozambique reflected on what was learned from the visit to the horticulture farm. He observed Kenya was ahead in production scale and government regulation. The horticulture sector in Mozambique is steadily growing after being at a slump during and after the 1970’s civil war. There is now an increasing domestic demand for fresh vegetables as a result of urbanization and a growing middle class. There is an increasing focus on safe food for local and export markets, although regulation and enforcement remains a challenge. Farmers have benefited from contracts with large supermarkets and mining companies in the north of the country. The key lessons EKN Mozambique takes home are public-private partnerships, innovation for increased and sustainable production, and regulatory frameworks to support an enabling environment. On financing instruments, it was argued by a participant that farmers should co-finance on-farm investments if these are market led initiatives. This was linked to the impact assessments done on hortIMPACT Business Case 1, which showed that 75% of farmers had adopted one or more of the good agronomical practices trained, whereas almost none had adopted the greenhouse technology due to their low purchasing power. For a number of reasons, horticulture smallholder farmers are considered “risky” by financial institutions, hence they may not be able to access financial products to enable them to adopt the technology. EKN Kenya and the Equity Group Foundation are supporting farmers with better record keeping and exploring other financing models. In addition, the need to develop a scaling up strategy by each of the business cases was highlighted. For instance, the business case stakeholders could partner with agricultural universities to teach some of the lessons learned and create other informative TV and/or radio programs for wider dissemination of best practices. The selected lead farmers for the business cases should also have clear plans of how to finance their businesses for scale up. Some discussion took place about the option to pay a premium price for safe vegetables, similarly to the pricing system used in the dairy sector in Kenya. This however was not considered a good solution as food safety is everybody’s right. Gender in value chains was also raised following the two farm visits. The participants agreed on the need to focus on women-led businesses and the woman’s role in family farms, and not only on gender as a component in the final evaluation. SNV explained that for each of the business cases, due diligence on the enterprises is undertaken before they can be provided with the grant, and gender forms a key component of that process. For future programs, one participant suggested to consider exploring options for better inclusion of women and to look for partners willing to co-invest in inclusive business alternatives. Learning journey participants reflected on this visit in a session in the afternoon of the same day. They realized that for sectors such as dairy and horticulture, it is critical that approaches of value chains or farming systems are not only focused on the practical level but also on the enabling environment for farms and firms. Inclusiveness was among the key issues discussed. Market led value chains are assumed to be inclusive, and the programs the group visited seem to include the basic assumption that benefits trickle down. This raised concern among the participants. There exists a thin line between building and strengthening trade and investment, and reducing poverty by supporting the poor in the aid and trade agenda. The farm visits elicited discussions on food security, while nutrition wasn’t as much of a feature as expected. The participants argued for focusing on sustainable food systems – those that provide food security and nutrition in such a way that they create the economic, social and environmental bases to sustain future generations. It was shared that KIT is developing a set of improved nutrition indicators to be used in agricultural value chains, which could feed into future embassy programs. 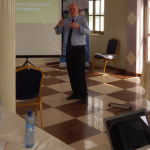 Lastly, it was concluded that monitoring and evaluation of programs needs to be more robust. Currently, monitoring and evaluation makes use of proxies, such as more jobs being created, and more liters of milk produced by the farmer.